Today, July 14, is an historic day in Gaelic football as the new All-Ireland senior football quarter-final comes into play. For the first time, the last eight are divided into two groups of four in a round-robin format, with the top two advancing to the semi-finals. Ireland is divided into four (uneven) provinces, each of which runs a knockout championship. Until the end of 2000, each provincial champion advanced to the All-Ireland semi-finals, but a change of system came the following year. It allowed teams beaten in their province a second chance in a national knockout qualifier series, with each new round bringing more sides which had been eliminated from the provincial championships. When the qualifiers were whittled down to four, they then joined the four provincial winners in the new All-Ireland quarter-finals. In the very first year of the new system, 2001, Galway became the first team to win the All-Ireland having previously lost a game. With this new addition to the fixtures programme, it will be possible for a county to triumph despite losing two or even three games out of eight or nine. For the 2000 Leinster championship, Meath were drawn with Offaly in the quarter-finals. Both counties were green, white and gold and while there had been changes of colours in the past, during the 90s this had stopped happening. In 2000, though, sense prevailed in that both counties were to wear alternative jerseys. 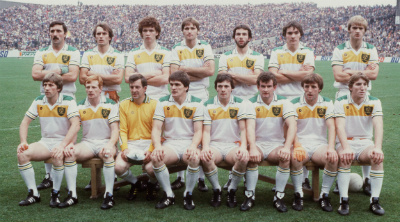 Offaly wore white jerseys with green and gold stripes around the shoulders – derived from the 1982 All-Ireland-winning change kit – and Meath wore gold jerseys with green trim. However, this was unlike anything worn by the county before or since. The gold and green were far darker than the traditional shades, while the sleeves were noticeably shorter. The chevron motif would become common among O’Neills’ designs in the early 2000s and while the players wore the older, lighter green, socks, most wore them around the ankles so they didn’t jar that badly. 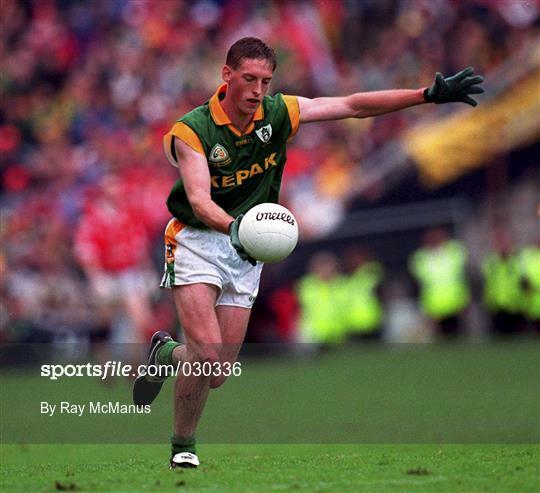 A possible inspiration for the sleeves was that, during Meath’s successful run to the title in 1999, one of their key players, Trevor Giles, had taken to cutting his own sleeves to guard against shirt-pulling. We asked Giles about this a few years ago as part of a feature on infamous GAA jerseys, but he said he didn’t have a direct role. 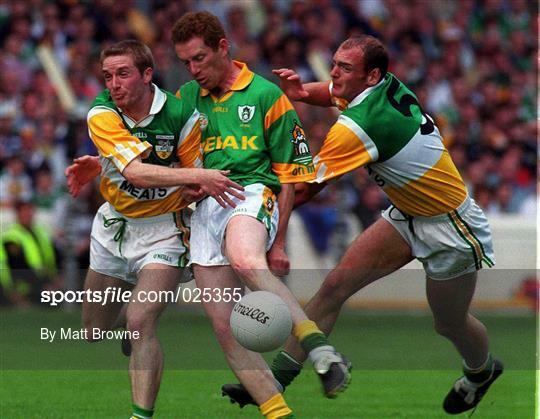 There was a fairly unusual one we wore against Offaly in 2000, gold with dark green trim and very short sleeves. We lost though and the following year we had a more ‘normal’ design, maybe if we’d have won we might have gone with a green version of this. The previous couple of years I had gone off on a tangent and taken to cutting off my sleeves and I kept doing it because we were winning, but I actually didn’t have anything to do with these, they were just what arrived from O’Neills the week of the game. Despite the result, a lot of the lads actually liked it and maybe it’s more memorable because it was only worn in one game. As Giles mentioned, Meath were beaten and it’s one of the great unanswered GAA kit questions as to whether they would have received a green version of the new style for the Leinster semi-final against Kildare. While their new jerseys for 2001 did feature the darker green, it was only as a trim colour with the normal emerald retaining its primacy.